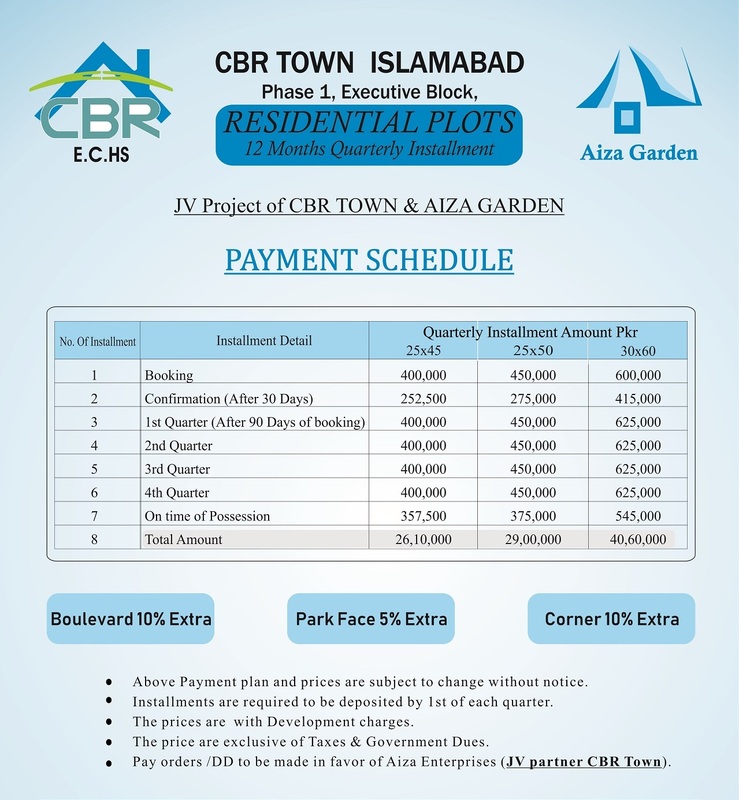 CBR Town Phase 1 is an approved housing scheme under Capital Development Authority. It is ideally located close to Soan Gardens on Islamabad Highway, and It is a fully developed housing scheme where many houses have been built and families are enjoying all basic amenities of life. Executive block is just an extension of the existing area where development work is already in progress. Executive block offers 25×45, 25×50 and 30×60 residential plots on 12 months installment plan. Bookings start from just 25% down payment + confirmation charges, while remaining amount is payable in 4 equal quarterly installments. Boulevard and corner plots cost 10% extra, whereas Park Facing plots will cost 5% extra charges. All payments are made in favor of Aiza Enterprises, which is the JV partner of CBR Town. Should you require further details about CBR Town Phase 1 Executive Block, feel free to contact us via email at marketing@manahilestate.com.